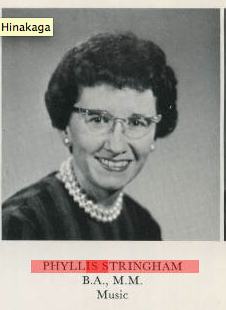 Phyllis J. Stringham, a longtime member of the AGO died on February 12, 2010 at her home in Waukesha, WI, at the age of 79. Her survivors include her brother James A. (Gladys); nephews, James R. (Judy), Timothy J (Judy), and Steven H.N. (Kay); many grand nephews, nieces, other relatives and friends. Phyllis was preceded in death by her parents, Harry and Wilma; brother, Robert; sister-in-law, Ruby; and nephew, James A. II. A celebration of her life was held on February 18 at St. Luke’s Lutheran Church in Waukesha, WI. A private burial service was held in Grand Rapids, MI at a later date. 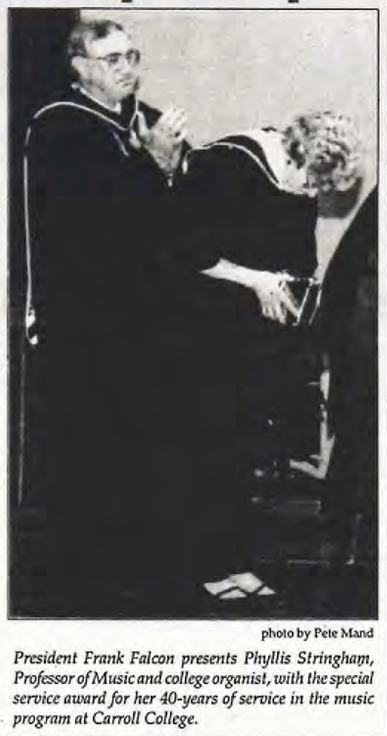 Phyllis, a native of Grand Rapids, MI, earned her Bachelor of Arts degree from Calvin College and a Master of Music degree in Organ Performance at the University of Michigan. Her teachers include John Hamersma, Robert Noehren and Marilyn Mason. For 43 years, she was Professor of Music and College Organist at Carroll University, Waukesha, WI (1959-2002). After retirement from teaching, she retained her position as College Organist and Curator of the Organ. 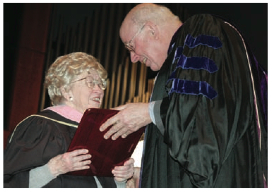 In 2007 she was named Organist Emeritus. Her earlier teaching career began at Chatham Hall, an Episcopal School in Virginia. She has been heard in concerts in the east and Midwest. She is listed in Who’s Who in the World of Music. A lifelong learner and student of the organ, Phyllis pursued additional study at the Ecole D-Americaine in Fontainebleau France, studying with Nadia Boulanger and Andre Marchal. In 1966 she studied with Marie-Claire Alain and Anton Heiller at the Summer Academy for Organists in Haarlem, Holland. While on sabbatical leave in 1972, she spent five months studying at the Hochschule fur Musik in Vienna, Austria. Further study was done at the Eastman School of Music with Russell Saunders and Delbert Disselhorst at the University of Iowa. From the late1960s to 2007 she was founder and director of the Phyllis Stringham Concert Management agency, promoting many nationally known artists. She served as Dean of the Milwaukee Chapter of the AGO and as Wisconsin State Chair of the Guild. She also served as National Organ Division Chairman for the Music Teachers National Association. 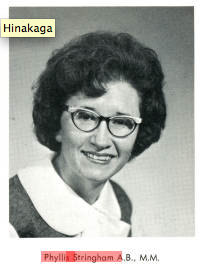 Phyllis in 1960 as she was just beginning her long tenure at Carroll College. Phyllis poses with Sister Mary Hueller at the November 15, 2002 dedication recital at St. Jerome's, Oconomowok. Phyllis posed with members of the Milwaukee Chapter at the 1974 National Convention in Cleveland. front row: Hildegard Fischer, Lois Toeppner, Fr. Tom Lijewski, Sr. Mary Jane Wagner; row two Ed Wise, Bill Wojnar and Phyllis Stringham; row three Charles Henderson and A. Mueller.